I’m spending a long weekend with my cousin and family in Leonia NJ. 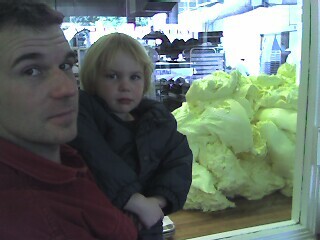 Today we went to the bakery, and were met at the door by the largest pile of butter I have ever seen. It was awesome. I had a shockingly good chocolate chip cookie, and we brought home a giant, and delicious, loaf of bread. Unfortunately I was not able to connect with my NYC juggler pals, but I’ve got a whole day and a half left in Leonia, so who knows what else might go down. Not to rain on your parade but Leonia doesn’t nor did it ever have a bakery. Balthazar Bakery in on S. Dean Street in Englewood!!!! But the butter is pretty cool to see…. Thanks for pointing out the error. I fixed it… now go eat some butter! Mark Hayward Is My Hero is powered by	WordPress 5.1.1 and delivered to you in 0.265 seconds using 36 queries.